This post is sponsored by my friends at International Delight, but the opinions expressed are all my own… just as always. 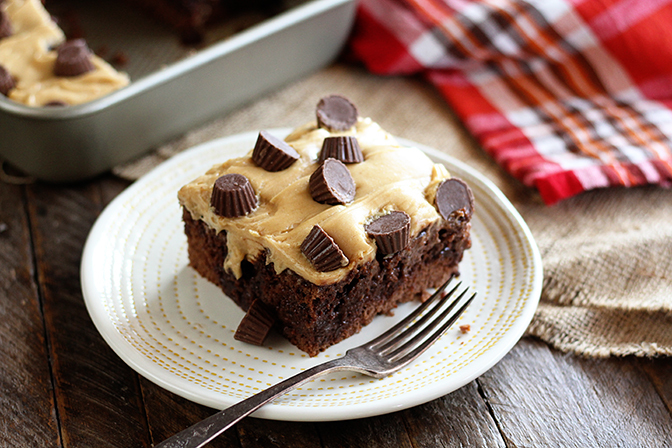 I’m not afraid to admit that I think chocolate and peanut butter are one of the most iconic flavor pairings – not to mention one of my personal favorites. And I’m proud to say that the apple hasn’t fallen far from the tree when it comes to that particular love. Jack is just about as passionate about the flavor combo as I am. In fact, he’s requested a chocolate peanut butter birthday cake for two years running now. And I’m happy to oblige. But I’m not always up for turning out a homemade 4 layer chocolate cake with peanut butter filling and chocolate buttercream frosting. Don’t get me wrong. I don’t mind on special occasions like birthdays, but certainly not on a random Tuesday. So I created this Chocolate Peanut Butter Poke Cake. I’ve professed my love for sheet cakes before. They’re perfect for when you want a delicious cake, but don’t want to fool with the hassle of a layer cake. And no one ever complains about turning a sheet cake into a poke cake by filling it with a delicious creamy filling, right? So this is the best of both worlds. 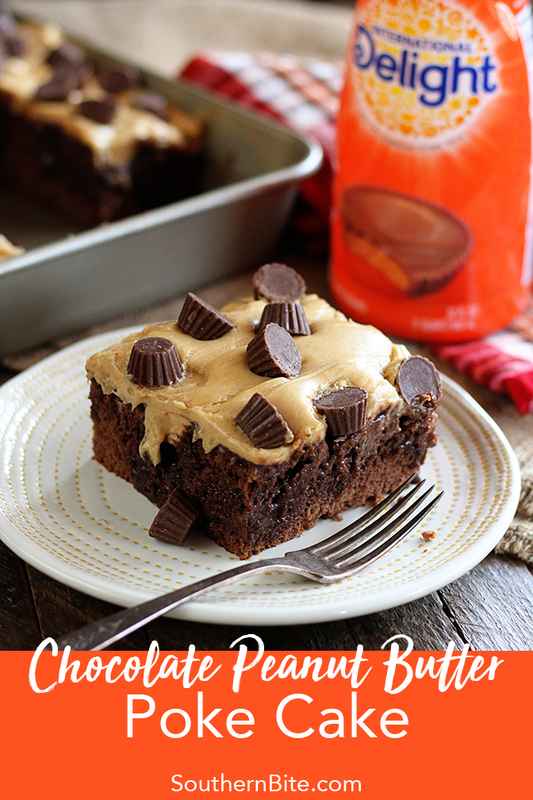 Seriously, if you love Reese’s peanut butter cups, you’re going to flip over this. And I’ve added even more Reese’s flavor by using International Delight’s Reese’s Peanut Butter Cup Coffee Creamer to the filling. The frosting, made with creamy peanut butter and whipped topping, is peanut butter perfection. 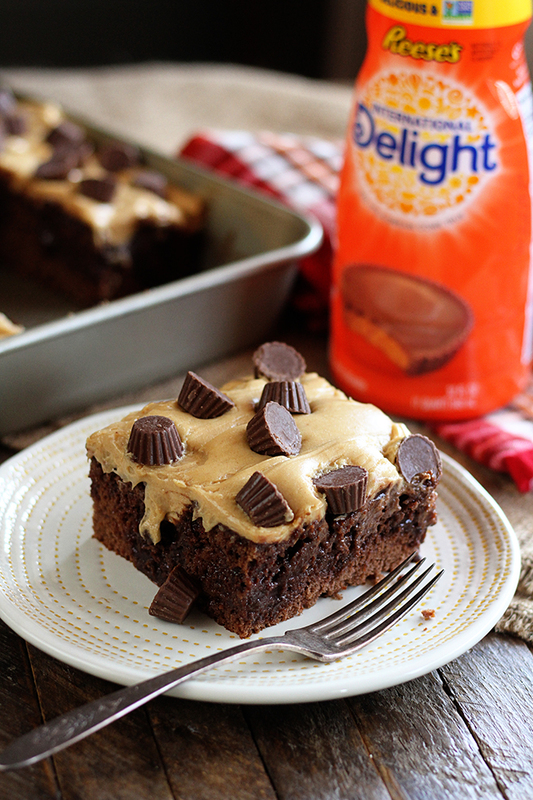 And it’s topped with mini Reese’s cups! Y’all are just going to love this one! Prepare the cake according to the package directions. Allow to cool 25 to 30 minutes in the pan. Use the stick end of a wooden spoon to poke holes in the cake. 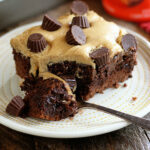 In a medium bowl, whisk together the pudding mix and the Reese's creamer to make the chocolate peanut butter sauce. Allow the mixture to thicken for about 10 minutes, then pour over the cake and into the holes. *The mixture will not thicken completely to pudding consistency. In a large bowl, whisk the peanut butter into the thawed whipped topping. Spread the frosting over the cake. Sprinkle the peanut butter cups evenly over the frosting. Cover and keep refrigerated. Stacey, This looks delicious to me and is one of my favorite flavor combos as well. Thanks for this recipe. I can hardly wait to try it! I sure hope you’ll enjoy it, Patti!! 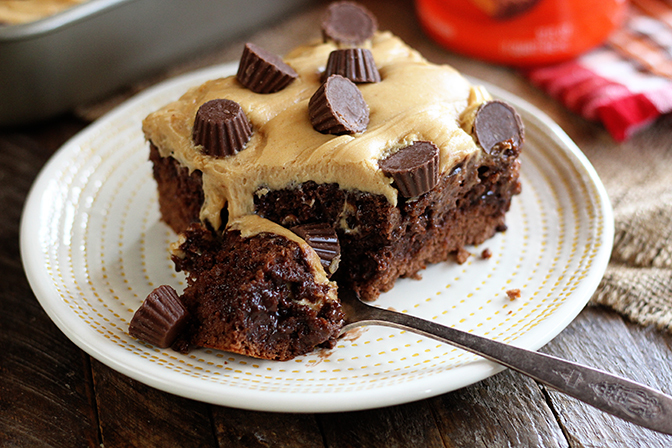 I grew up loving chocolate cake with peanut butter frosting!! it’s one of my all time favorite comfort food. This just takes it a step up. WOW! And this one’s super easy too! I made this for my peanut butter loving preacher’s pastor appreciation day yesterday. It was AH-MAZING. There was zero left! We scraped the pan to get any left when we got home but there was only crumbs! Thanks for a great recipe! I am SO glad everyone enjoyed it!!! Is there an option if the Reeses’ creamer is not available in your area? You can always use milk or half and half, you’ll just miss out on a little of the flavor.